Rachel Muthoga is the Executive Director, Moving the Goalposts Kilifi (MTG), a community-based organization, established in 2001 that works with girls and young women in Kilifi County, Kenya. MTG is recognized as an innovative and unique sport and development project for girls and young women. MTG’s vision is that girls and young women’s human rights are realized and protected. Using results based and rights focused MTG, through football aims to strengthen and promote the voice, impact and influence of girls and young women, in Kilifi county and in Kenya. 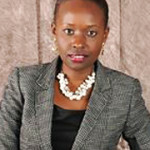 Rachel Muthoga is an advocate of the High Court of Kenya with over 7 years experience. She was admitted to the Bar in 2006 and has varied practice and policy making experience. She holds a Master of International Legal Studies with a Certificate in Human Rights from Georgetown University in Washington, DC where she graduated with Distinction. She undertook her undergraduate studies at the University of Nairobi, graduating in 2004. She is also an Associate of the Chartered Institute of Arbitrators, UK. Before joining Moving the Goalposts Kilifi, she was the Country Coordinator, Physicians for Human rights, an organization based in the US, of which she was running the Kenya office and implementing programs on women’s rights, advocacy and sexual and gender based violence. She has also worked for the U.S. Embassy in Nairobi as the Legal Assistant to the Resident Legal Advisor in the Department of Justice, working on the implementation of the Women’s Justice and Empowerment Initiative and providing development support to the criminal justice system in Kenya. Her experience also includes having worked in a private law firm before joining the Law Society of Kenya, the umbrella bar association as a program officer implementing the advocacy work of the society including legal aid and civic education. She is a member of the Independent Medico-Legal Unit Justice Network, a group of human rights defenders and sits on the Leadership Team of the Kenya Chapter of Prison Fellowship International dealing with restorative justice and prison reform. She has been an active civic educator and trainer on women’s rights.